With a stay at Tunacan Hotel in Fethiye, you'll be within a 10-minute drive of Oludeniz Beach and Oludeniz National Park. This hotel is 8.3 mi (13.3 km) from Calis Beach and 5.1 mi (8.3 km) from Amyntas Rock Tombs. 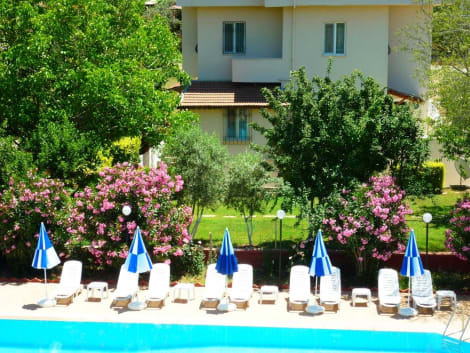 This hotel is located in Hisaronu, a short walk (50 m) from the main street with its many shops, bars, restaurants and links to the public transport network and 100 m from the nearest nightspots. It is within easy access of local transport to the famous lagoon and beach at Olu Deniz (3 km away) and the market town of Fethiye, which is 10 km from the hotel. Attractions in the surrounding area include the old Greek village of Kaya Koy (5 km), Saklikent (35 km), the Dalyan mud baths (35 km) and the ancient city of Patara and its beach. Dalaman Airport is 60 km away. Renovated in 2010, this small establishment is built in the traditional style popular in this area. This family-friendly hotel comprises a total of 37 rooms, including 6 junior suites, over 3 floors. Facilities on offer to guests at this air-conditioned establishment include a lobby area with a 24-hour reception and check-out service, a hotel safe, a currency exchange facility and a TV lounge. There is a snack bar/bar and a restaurant. Guests can also take advantage of the room and laundry services (charges apply). Parking facilities are available for those arriving by car and it is possible to hire bicycles on the premises (charges apply). The standard rooms are pleasantly decorated and feature tiled floors. All come with a private bathroom with a shower, a WC and a hairdryer and offer a double bed or twin beds. They are equipped with a telephone, satellite TV, a radio and a mini fridge. Furthermore, individually regulated air conditioning (charges apply) is offered and the rooms feature a balcony. The hotel features an outdoor swimming pool and a separate children's pool. Guests can relax on the sun terrace and there is a poolside snack bar with sun loungers and parasols. Guests will find a pool table, table tennis and darts provided for their entertainment. Occasional Turkish nights are held at the hotel. Moreover, sun loungers and parasols are available for hire on the sandy/pebble beach. With a stay at The Blue Lagoon Deluxe Hotel in Fethiye (Oludeniz City Center), you'll be within a 15-minute walk of Oludeniz Beach and Oludeniz National Park. This hotel is 10.9 mi (17.5 km) from Calis Beach and 4.9 mi (7.8 km) from Butterfly Valley. With a stay at The Green Valley Hotel in Fethiye, you'll be within a 10-minute drive of Oludeniz Beach and Oludeniz National Park. This hotel is 8 mi (12.9 km) from Calis Beach and 4.9 mi (7.9 km) from Amyntas Rock Tombs. Satisfy your appetite for lunch or dinner at the hotel's restaurant, or stay in and take advantage of the 24-hour room service. Quench your thirst with your favorite drink at the poolside bar. A complimentary buffet breakfast is served daily from 8 AM to 10 AM. At Leytur, enjoy a satisfying meal at the restaurant. Relax with your favorite drink at the bar/lounge or the poolside bar. Make yourself at home in one of the 33 air-conditioned rooms featuring private pools. Rooms have private balconies. Satellite television is provided for your entertainment. Conveniences include safes and minibars, and housekeeping is provided daily. With a stay at Cennet Hotel in Fethiye, you'll be within a 10-minute drive of Oludeniz Beach and Oludeniz National Park. This hotel is 8.9 mi (14.3 km) from Calis Beach and 5.8 mi (9.3 km) from Amyntas Rock Tombs. On the east coast of Turkey, Olu deniz's main attraction is its famous picture postcard bay, known as one of the most beautiful beaches in the world. This resort also boasts a promenade lined with small shops, cafés, bars and restaurants, but there are many other beaches to find and a huge amount of trips and activities on offer. All of this makes Olu deniz an ideal beach holiday. The Blue Lagoon of Olu deniz has calm, shallow waters which makes it ideal for children and a variety of water sports, such as kiteboarding, windsurfing and pedalos. Less than 7km away is a canyon surrounded by approximately 350m high mountains, where you can see beautiful jersey tiger butterflies. Transportation to the bay is either by boat or by a rather tricky path, but once here you can enjoy its gorgeous waterfall, large beach and clear water. 3km from Oludeniz, the secluded Kidrak Beach or 'Paradise Beach' is a romantic area which maintains an unspoilt beauty. Travel up Babadag Mountain, which towers above Oludeniz, on a 50-minute ‘jeep safari', an unrivalled opportunity to take in the extraordinarily beautiful Turkish mountainside scenery. The mountain is a geological marvel, with incredible thermals making it reputedly the best site in Europe, if not the world, to paraglide. Gracefully glide tandom above the scenic bay for up to 45 minutes, virtually unheard of in any other location in the world. A trip of a lifetime. Cruise down the peaceful Dalyan Delta, passing the ancient rock tombs of Caunos. Then, take an all-over mud bath and a dip in the sulphur springs. If you do this, you will supposedly feel and look 10 years younger. Enjoy a buffet lunch served in Dalyan village, followed by a relaxing swim at Iztuzu beach, one of the last nesting places of the endangered Caretta Caretta turtles, which can measure up to four feet. Olu deniz is a main Turkish resort, and as such there is plenty going on in the way of food and drink. There are restaurants to suit everyone's tastes, with excellent standards and a huge range of Turkish cuisine and international foods. The area is the home of the olive, the aubergine, the vine and crisp, honeyed Baklava. Turkish cuisine offers kebabs, mezes and olive oil-drizzled salads. The Olu deniz beach bars open early in the day, which allows you to enjoy the turquoise sea and blue sky at your leisure. After 10pm these bars liven up with happy beach grooves, funky tunes and a happening party atmosphere. On the seafront in a beautiful location, Buzz Seafood & Grill has long had a reputation for fresh, innovative seafood and grill fare, not to mention delicious speciality cocktails. With indoor and outdoor waterfront dining, Buzz is a great place to relax. There are plenty of Olu deniz hotels just waiting for you to book your getaway today.